President Barack Obama has been re-elected for a second term as president of the United States, beating his rival, Republican Mitt Romney. Polls predicted a very tight race, but Mr Obama managed to secure the required 270 electoral college votes - and more - before the clock struck midnight on the east coast. Mr Obama has one big thing going for him: voters seem to like him personally, and many remain loyal to him even while frustrated by the nation's lingering hangover from the recession. His campaign team appears to have enticed many of his 2008 supporters back to the polls, while also persuading undecided voters that Mr Romney was not the man they wanted to lead the country. Mr Obama took office amid one of the worst recessions in decades. And as the nation went back to the polls, the US unemployment rate hovered stubbornly just below 8%. The Democratic Party suffered historic losses in the mid-term polls in November 2010, with the Republicans emerging energised and more determined than ever to promote their conservative agenda and stymie the president's plans. Mitt Romney and the Republicans hoped that Mr Obama would be unable to inspire the same enthusiasm that carried him to the White House and that independent voters would dump him amid a still-lagging economy. Barack Hussein Obama made history on 4 November 2008 when he easily defeated Republican rival John McCain to become the first black president of the United States. Aged 47 when he was inaugurated, Mr Obama was also the first urban president since Harry Truman, and the first president born in Hawaii. And unlike John McCain, George Bush and Bill Clinton, his background was not steeped in the Vietnam War or the cultural conflicts of the 1960s. During his challenging first term in office, Mr Obama and his fellow Democrats scored several historic achievements. They overcame stiff Republican opposition to pass an economic stimulus programme, overhauled the US healthcare system, laid down new rules for Wall Street and the banking industry, and rescued the US auto industry from collapse. Later, he and the Democrats overturned a two-decade-old law banning openly gay Americans from serving in the US military. Wielding his presidential authority, Mr Obama also acted without the consent of Congress to grant temporary legal status to some young illegal immigrants brought to the US as children. Mr Obama despatched a team of commandos to kill Osama Bin Laden, brought the US war in Iraq to a close and struck a new nuclear arms treaty with Russian President Dmitry Medvedev. Early in his presidency he escalated the US-led war in Afghanistan. But Mr Obama has since brought home the 33,000 extra troops he sent to that theatre of conflict. He also committed the US to turn the security mission over to Afghan troops by the end of 2014, in an attempt to end a war that began more than a decade ago. Mr Obama was born in 1961 and named after his father, a Kenyan intellectual who met the future president's mother, Ann, a white teenager from Kansas, while studying at the University of Hawaii. When Mr Obama was a toddler, his father abandoned the family and the couple divorced. Father and son were to meet only once more, during a brief visit to Hawaii in 1971 by the elder Barack Obama. He died in a car crash in 1982 in Nairobi. When Mr Obama was six, his mother married an Indonesian man and the family moved to Jakarta. Then known as "Barry", Mr Obama later moved back to Hawaii, where he was raised mainly by his grandparents. Mr Obama's upbringing in Indonesia, the world's largest Muslim country by population, and his Kenyan-Muslim heritage fuelled right-wing conspiracy theories that he was not born in the US, or that he was a secret Muslim. In 2008 and 2011, Mr Obama produced two separate copies of his birth certificate to prove that he had been born in the US state of Hawaii. After graduating from Columbia University in New York, Mr Obama worked for three years as a community organiser in poor neighbourhoods in Chicago. He then attended Harvard Law School, becoming the first African-American president of the Harvard Law Review. While working at a Chicago law firm, he met Michelle Robinson. The couple married in 1992 and have two daughters, Malia and Sasha; the Obamas became the first couple since Jimmy and Rosalynn Carter to live in the White House with young children. After Harvard, Mr Obama returned to Chicago to practise civil rights law, representing victims of housing and employment discrimination. He joined the law faculty at the University of Chicago, where he was lauded as a popular teacher and an exceptional legal thinker. In 1995 he published his first book, Dreams from My Father, a memoir, and the following year he was elected to the Illinois state senate. As a state senator, he spoke out strongly against the coming Iraq war, a position that later helped him win early support in the Democratic primary race. Mr Obama tried to run for Congress in 2000, but was thrashed by the incumbent in a Democratic primary. But four years later he was back, running for the US Senate. He won that campaign after electrifying the Democratic National Convention with a speech about self-reliance, aspiration and national unity. After his landslide election to the Senate a few months later, he became one of the most visible figures in Washington, and soon published a second best-selling book, a politics-and-policy tract entitled The Audacity of Hope. On Capitol Hill, Mr Obama established a liberal voting record, but also worked with Republican colleagues on HIV/Aids-education and prevention and nuclear weapons proliferation. When he embarked on his presidential campaign in February 2007, he had been in the Senate only two years, and his opponents sought to cast him as ill-prepared for the presidency. But his campaign excited millions of liberals - especially young voters - who were yearning for something new in Washington after two terms under George W Bush. Mr Obama clinched the Democratic nomination after a long and gruelling battle against former first lady Hillary Clinton, whom he later appointed secretary of state. His victory over septuagenarian Republican Senator John McCain was aided in part by public perceptions that Republican policies had contributed to the economic tumble - and that Mr McCain was not the candidate to steer the nation to recovery. 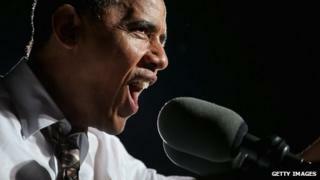 Now, Mr Obama and his team of strategists and advisers have secured four more years in office. Employment figures have slowly climbed, the housing market is showing signs of a comeback and consumer confidence is up. But there lingers among the electorate a widespread sense of unease and dissatisfaction with the way things are going. Mr Romney, his vice-presidential running mate Paul Ryan, and the Republican Party had their campaign bolstered by big-spending patrons eager to despatch Mr Obama to political oblivion. They blamed Mr Obama's policies for the ongoing economic malaise, and hoped voters would overcome their fondness for - and political investment in - him. The electorate judged otherwise.